Added by Amy Rebecca K.
Mosaic Jewish Outdoor Club of South Florida is an all-volunteer, non-profit organization dedicated to providing Jewish people the opportunity to enjoy outdoor activities. One of our goals is to provide easy access to outdoor activities while at the same time promoting an awareness, interest, and understanding of the importance of preserving our natural environment. The South Florida Chapter of Mosaic hosts a multitude of different activities , we serve Dade, Broward, and the Palm Beaches and our events include a wide variety of traditional outdoor activities, including team sports, water activities, nature hikes, National Park Camping, Shabbat events, Marine Life Center visits, and much more. Additionally, many of our activities include philanthropic, environmental awareness, social and/or educational components. Look at our events calendar to see our upcoming activities. Even if an activity isn't close to home, give it a try. Half the fun is getting there, and it's a great way to explore some new areas. We also enjoy a once a year opportunity to participate in the annual Jewish Outdoor Escape (JOE). 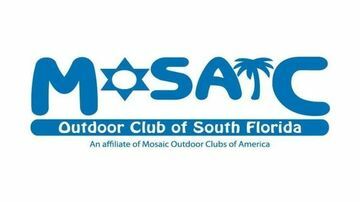 The Mosaic's Jewish Outdoor Escape happens every year during an extended Labor Day Weekend. It gives Jewish outdoor enthusiasts from all over the world the opportunity to spend time with each other in a Jewish setting, and enjoy out-of-doors activities. We stay at a summer camp and the activities vary each year depending on the locale. Over 100 like-minded Jewish adventurers attend this event each year. The experience will typically include hiking, kayaking, biking, nature walks, horseback riding, arts & crafts, dancing, workshops, swimming, campfires, field games, photography, swimming and some great surprises! Indulge Yourself- We all work hard...time to have some FUN!